Caption slip reads: "Photographer: Snow. Date. 1960-06-03. Reporter: Waymire. Assignment: Junior fire chief. 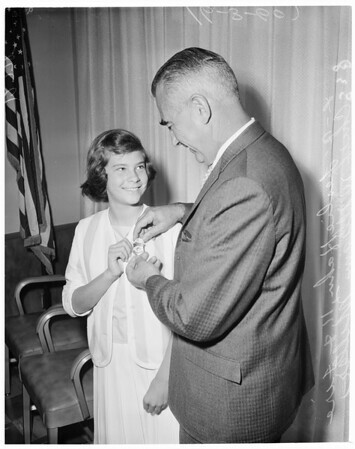 Leslie Hahn, 11, receives her badge as chief of the Los Angeles Junior Fire Dept. from Fire Chief William Miller at awards luncheon."